Last week, we told you about a long-suffering Cleveland sports fan's cry for help. This week, after the Browns managed to be even worse in week three than in the first two weeks of the season, some fans have begun circulating a petition inviting the team's owner to sell the franchise. Sure enough, others are circulating a counter-petition, asking owner Randy Lerner to ignore those other fans. If you happen to be among those who believe petition drives have any effect in the real world (I'm not, alas) perhaps this gives you a glimmer of hope for your team. The rest of us will just quietly lick our wounds and go about our business, as usual. Perhaps our favorite Argentinian reader, Mariana, can give us a more hopeful update about her favorite soccer team. UPDATE: A new Sports Illustrated columnist (and Cleveland-area native) wonders aloud: is new Browns coach Eric Mangini the worst hire ever? In the crunch of events, we somehow missed the crucial news that last week was National Punctuation Day! Thank goodness our friend Mike Quinn was more on the ball, and took note of it, thus tipping us off. We'd love to hear your thoughts about your favorite form of punctuation and/or top punctuation memories. If you'd like to send along some photos as well, by all means, please do so. We know how emotional people can be about their punctuation. Ron Copfer made in that string: how, as a longtime employer, he had come to appreciate the contributions of English majors. I'll be facilitating a workshop on feature writing this Saturday morning at the Lee Road Library in Cleveland Heights. While it's sponsored by the Heights Observer, a community owned paper, and thus targetted at citizen journalists, we'll no doubt have a wide cross section of folks on hand for a lively discussion. I expect everything from curious beginners to pros intent on brushing up their skills (including at least a couple of WWW readers whom I've already heard from), traditional-age students (we should all be lifelong students, right?) to those who are just curious about reading. Even some folks who simply want to be better citizens. If reading, writing or citizenship hits your buttons, we'd love to have you there too. --Brian Tarcy, co-author of The Complete Idiot's Guide to Football, and a Browns' fan, tells the Washington Post what it's really like to be a long-suffering sports fan in this region. It's beginning to feel like a chapter from the Old Testament, folks. You know, the Book of Job, about epic loss and frustration that never ends. We've dealt with this topic earlier, though always in the context of the basketball Cavs, most recently when they were unceremoniously ousted from the playoffs this spring. We also talked about the longer history of Cleveland sports frustrations in this piece three years ago. May we never feel the need to return to this subject again. Fat chance of that. --at least according to this Latina poet. We'd love to hear about how you may or may not be stuck in a rut with your writing, and what might constitute switching positions. Or as our friend Art would say, how you manage your creative crop rotation. As it happens, we were privileged to finally meet our longtime commenter Art Durkee earlier today, as he traveled through town. We'll save that report for another day. Suffice it to say for now that the in-person conversation was even more sublime than the virtual one we've been having for a couple years. --novelist John Steinbeck, whose classic Great Depression-era novel The Grapes of Wrath is garnering renewed interest during this current Great Recession. 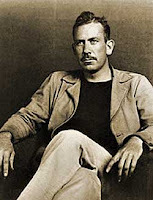 This is Steinbeck's inaugural mention here. --from my friend Mary Beth Matthews' incredible blog. If there's a better example of a teacher writing with vivid honesty about how urban public education really works in America, I've yet to come across it. Here's hoping this heroic woman continues to touch young lives with her almost freakish dedication. I also hope she'll one day write a book full of all she knows about what takes place in school classrooms. It would be an unforgettable book. I couldn't help noticing how she evidently follows the progress of her former students over a lifetime with the same kind of perpetual interest that I have about anyone I've written about in the past. --Winston Churchill. You can review an earlier mention of the late British leader here. If you're of a certain vintage, perhaps you remember the famous series of commercials for the now-defunct brokerage house E.F. Hutton. It was so well done and so vivid that it's often remembered today in conversations, years--hell, decades--after it stopped running. It went like this (or at least one of them did): two older guys of means were sitting at a table talking about the stock market, and one of them begins to say '...and E.F. Hutton says...' and the entire roomful of people stopped talking and craned their necks, hoping to listen in on the advice (you can see another variation of the TV ad here). It was one of those rare ads that managed to break through the incessant clutter of advertising and into the larger cultural conversation. Anyway, we're blessed to know a few people such as that, folks so sharp and discerning that you tend to sit up and take notice when they say something. One of them is Doug Mazanec, a.k.a. Infoman. We noticed the other day that he spoke highly of a new word-obsessed website, Worknik, and we decided to give it a look. Remember, it's labeled "beta," a software term that means it's a work in progress. But please give it a look and let us know what you think. As for you, Infoman, thanks for the tip. UPDATE: Our old friend Kate Oatis, a dear classmate from college and one of the smartest, sweetest women in America (you can look it up! ), who's a fellow writer and Russian history buff, sent along this site for my inspection. I figured as long as you're already checking out Doug's Wordnik, you might also render your opinion on the Motivated Grammar blog. And don't forget to check out Kate's blog as well. --the late Russian-born novelist Vladimir Nabokov. After reading this I was immediately transported to my nights as a nurse on the oncology floor. I've been blessed to have those connecting moments with patients. As a new nurse I was terrified to take the dying patients. I didn't know what to say, felt awkward, and just downright sorry for everyone. The longer I worked there the fonder I became of this type of nursing. I started to request the dying patients and didn't mind if I had three or four at a time. It was a gift to be able to care for them during that sacred time. People are so vulnerable and afraid. I found that the night-time was the hardest for them because there were no distractions. Most families were gone and the only person to give them any comfort was the nurse assigned to them. Sometimes you would meet the patient for the first time and a few hours later you would be helping them through a crisis or even their death. I once had a patient assigned to me that I was told was having end of life issues. She was afraid to die because she was unsure if she believed in heaven. She had been struggling with this for a few days and had been visited by the hospital chaplin, various family members, etc. She was one of eight patients I was assigned to that night, several of which had a lot going on that would need my direct attention. I felt led to go see her first, even though I could have easily started with another task. I walked into her room and found the seventy year old sitting up quietly in her bed. I pulled a chair close and introduced myself as her night nurse. I then reached for her hand and gently talked about what I had been told from the other nurse concerning her possible death. I shared some of my thoughts about death, asked if there were any questions she had, and if I could help her in anyway. She gave me the most peaceful knowing smile and said, "No sweetie, I'm fine now." I asked her if there was anything she needed and she declined. I left her and went on to check on my other patients. It took me an hour and a half to see them all before I could go back to check on that first patient. When I did I found she had quietly died. It is in those moments that I feel God reassuring me that I chose the right profession. I could go on and on about the many people I have cared for. This particular one is high on my list. Thank you for sharing. I am going to email my mom the article. She's a nurse as well. --E.B. White. You can find earlier mentions of the immortal one here. Looking for a good writerly biography? Scott Eledge's book on White's life is perhaps the best biography of a writer that I have ever read. Northeast Ohioans know there's always a lot to do around these parts on weekends, perhaps doubly so in the autumn. But there are some particularly interesting events from which to choose this weekend. Though it's been happening annually for 20 years, I never knew the Cleveland Museum of Art hosted a chalk festival to highlight the sidewalk chalk arts. It's happening this Saturday and Sunday, and looks awfully interesting. I'm hoping to poke my head in for at least a brief look on Sunday. A bit to the south, NPR's Michael Feldman brings his Whad' Ya Know? show to Wooster on Saturday, which I would have loved to attend after listening to and enjoying the show for many years. But tickets no doubt were snapped up instantly as soon as they became available (though the website says some tickets will still be available at the door, however improbable that seems, given the deep reverence of so many for this show). And in any event, I was already obligated to serve as a volunteer for yet another interesting and important event this weekend, a bike ride to celebrate the life of professor Miles Coburn, tragically killed in a crash last year, but a man whose life really made an impact (more about which later). Here's hoping you enjoy your glorious early fall weekend. We'd love to hear how you plan to spend it. And if you happen to make it to any of these events, we'll especially hope for a report on how it went. UPDATE: A new writer friend, Audrey McCrone, whom I met only the other day at an SPJ event, noticed this subject, and sent me the photo you see above, which she snapped of a past Chalk Festival. Audrey's an impressive lady with boundless energy, passion and enthusiasm for journalism, as one of her college administrators noted here. You can sample from some of her essays here. We feel blessed to know her. --Anatole France, a French poet and writer who won the Nobel Prize for Literature in 1921. Proud to Proclaim Our Ignorance. A Cleveland company we've never heard of is among Fortune Mag's 100 fastest-growing companies. Yet Another Health Myth? Canada's leading newsweekly thinks so. World's Weirdest Hotels. Which one is your favorite? Ten Oddest Places to Work or Live. Our favorite is #7. That Other 40th Anniversary (Sort Of). You can help write a history of the internet. Another Kind of History. We're guessing this headline might have drawn more than the usual amount of interest. Same Old Crap. This development reminded me of journalist Michael Kinsley's infamous principle about Washington outrages: the real scandal is not what people are doing illegally, but what's actually legal. And Finally...This is not a fake news item from The Onion, all appearances to the contrary. I'm just trying to imagine the experience of being coached by this disturbed cretin. 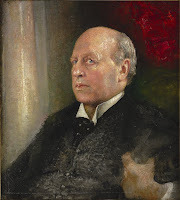 --the immortal Henry James, possibly the best novelist America has ever produced. If you've never read his masterpiece, Portrait of a Lady, you really ought to. When I read it in my mid-20s, not long before I got married, it continued to marinate in my brain for years. If you've somehow been led to believe that he was merely a writer of late-Victorian/early-Edwardian novel of manners that doesn't relate to your life, don't believe it. You can review our lone previous mention of James here. --the late writer Flannery O'Connor. We think this is perhaps the best explanation we've ever come across of why intellectuals and other ravenous-minded folks are sometimes so out of step with the larger culture around them. You can learn about a foundation dedicated to keeping her memory alive and a short fiction award named in her honor. --from literary bad boy Joe Queenan's rollicking good read in the weekend Wall Street Journal, his uniquely gimlet-eyed take on the "hegemony of dreariness" that has marked the summer just now coming to a close. You can review earlier best leads here. The Canadian newspaper the National Post raises the question what are some of the most irritating phrases in the English language? I think they nicely cover most of mine. Think of this as a companion of our earlier post about words that make you wince. So don't be shy: step right up and add your most irritating phrases. --the Italian writer, director and actor Luciano DeCrescenzo. We'd love to hear your stories about flying alone or together. If you're bummed out, worried, alarmed (take your pick) by the continuing meltdown in traditional journalism (about which we'll have an awful lot more to say in coming days and weeks), please consider doing this first. Take some time, though only when you have it, to click around and read some of this amazing work produced by the new batch of finalists for the Online News Association's annual awards. We can't say we've looked at all of it yet, and of course there are some things that will be familiar to just about any casual web reader, let alone those who are more devoted. But what we've reviewed thus far gives us renewed hope for the future. Naturally, we could use a whole lot more material like this. Anyway, enough about what we think. We'd love to hear your thoughts, including specifics about what you particularly liked here, and why. We won't settle any arguments, but merely hope to prompt a few. --the immortal British man of letters, moral philosopher and proud Catholic, G.K. Chesterton. An impressive portion of his vast papers are archived at John Carroll University, and local Chesterton societies exist in dozens, if not hundreds, of locations around the world. Despite his low name recognition in many quarters, some have called him the greatest writer of the 20th century (we think that mantle actually belongs to his contemporary, George Orwell). In any case, thanks to a longtime friend, WWW reader and soon-to-be grandma for sharing this quote. Today also happens to be the 70th anniversary of the commencement of World War II. He had died three years earlier.